PASADENA, Calif.--(BUSINESS WIRE)--From Alaska to homes all across the U.S., MOLLY OF DENALI, a groundbreaking new PBS KIDS series produced by WGBH Boston, will premiere nationwide July 15, 2019 on PBS stations, the 24/7 PBS KIDS channel and PBS KIDS digital platforms. The first nationally distributed children’s series to feature a Native American lead character, MOLLY OF DENALI is about Alaska Native Molly Mabray, a feisty and resourceful 10-year-old Gwich’in/Koyukon/Dena’ina Athabascan girl, who takes viewers ages 4 to 8 along with her on adventures and fosters literacy skills along the way. 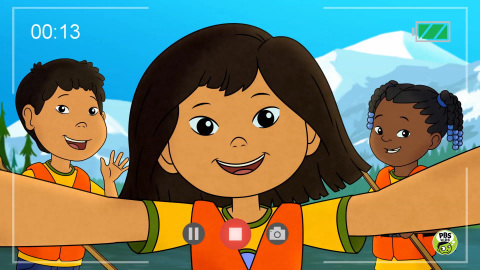 With an emphasis on family and intergenerational relationships, episodes of MOLLY OF DENALI model Alaska Native values, such as respecting others, sharing what you have and honoring your elders, while showcasing contemporary aspects of rural life, including strong female role models and how technology aids in communication. MOLLY OF DENALI is grounded in a pioneering curriculum focused on informational text, a foundational aspect of literacy education. Informational texts are designed to convey information and can include written words, images, graphics, video and oral language. In every episode, Molly navigates her world and solves problems with the help of books, online resources, field guides, historical documents, maps, tables, posters, photos, Indigenous knowledge from elders, her very own vlog and more. MOLLY OF DENALI includes Alaska Native voices in all aspects of the production, both on camera and behind the scenes. Every Indigenous character is voiced by an Indigenous actor, including the lead character of Molly, who is voiced by Alaska Native Sovereign Bill (Tlingit and Muckleshoot). Alaska Native screenwriters and producers are also part of bringing the series to life. WGBH Boston developed MOLLY OF DENALI with a working group of Alaska Native advisors, and is creating opportunities for developing Alaska Native talent via a Scriptwriting Fellowship. The show also gives young viewers a window into the Alaskan experience through live-action interstitials featuring local children and regions filmed by Alaskan production teams, including Alaska Public Media, KUAC, UAF Frame and Channel Films. The theme song was sung by Phillip Blanchett and Karina Moeller of the Yupik Alaska Native band Pamyua, and the Athabascan fiddle and traditional drum in the song were played by Gwich’in fiddler Brenna Firth. MOLLY OF DENALI is being developed as part of the Corporation for Public Broadcasting (CPB) and PBS Ready To Learn Initiative with funding from the U.S. Department of Education. The Ready To Learn Initiative brings educational television and digital media resources to children ages 2-8, and aims to promote early science and literacy learning, with an emphasis on supporting children from underserved communities. Each episode of MOLLY OF DENALI will include two 11-minute stories as well as a live-action interstitial. The first season will feature 38 half-hour episodes, along with a one-hour special. Starting in May 2019, kids and families can share in the early adventures of Molly and her friends through a new eight-part podcast series, a prequel to the PBS KIDS show debuting in July. Drawing on Native storytelling to introduce Molly and her home, The Molly of Denali podcast is a first from WGBH, in partnership with PRX and Gen-Z Media. The series is co-produced by WGBH and its animation partner, Atomic Cartoons, in association with CBC Kids. MOLLY OF DENALI is developed and produced with funding from CPB, the Department of Education’s Ready To Learn Grant, public television viewers and the Province of British Columbia Production Services Tax Credit. Corporate funding provided by Homer. Alaska Native working group: Adeline P. Raboff, Dewey Kk’ołeyo Hoffman, Luke Titus and Rochelle Adams. Language Advisors: Adeline P. Raboff, Lance X’unei Twitchell, Lorraine David, Marie Meade and Marjorie Tahbone. Informational text advisor: Nell K. Duke, University of Michigan. WGBH Boston is America’s preeminent public broadcaster and the largest producer of PBS content for TV and the Web, including Frontline, American Experience, NOVA, Masterpiece, Antiques Roadshow, Arthur, Pinkalicious & Peterrific and more than a dozen other prime-time and lifestyle series. WGBH is a partner in the digital channels WORLD and Create, and also is a major supplier of programming for public radio. As a leader in educational multimedia for the classroom WGBH supplies content to PBS LearningMedia, a national broadband service for teachers and students. WGBH also is a pioneer in technologies and services that make media accessible to those with hearing or visual impairments. WGBH has been recognized with hundreds of honors, including Emmys, Peabodys, duPont-Columbia Awards and Oscars. More info at www.wgbh.org. The Corporation for Public Broadcasting (CPB), a private, nonprofit corporation created by Congress in 1967, is the steward of the federal government’s investment in public broadcasting. It helps support the operations of nearly 1,500 locally owned and operated public television and radio stations nationwide. CPB is also the largest single source of funding for research, technology and program development for public radio, television and related online services. For more information, visit www.cpb.org and follow us on Twitter @CPBmedia, Facebook and LinkedIn, and subscribe for email updates. The contents of this series were developed under a grant from the Department of Education. However, those contents do not necessarily represent the policy of the Department of Education, and you should not assume endorsement by the Federal Government. The project is funded by a Ready To Learn grant (PR/AWARD No. U295A150003, CFDA No. 84.295A) provided by the Department of Education to the Corporation for Public Broadcasting. Click here to subscribe to Mobile Alerts for PBS. From Alaska to homes all across the U.S., MOLLY OF DENALI, a groundbreaking new PBS KIDS series, will premiere nationwide July 15, 2019.